The Point Pleasant Register, then a weekly paper, was housed in a small framed building, when editor George W. Trippett began printing the paper on March 6, 1882. He published the paper for more than 40 years. The masthead, listing Trippett as the editor and proprietor, indicated that the Daily Register was started in 1895. When plans developed for constructing a replica of this newspaper building in the middle 1970's, Oral Eads completed a set of plans for the museum that duplicated the 20-foot by 32-foot structure. 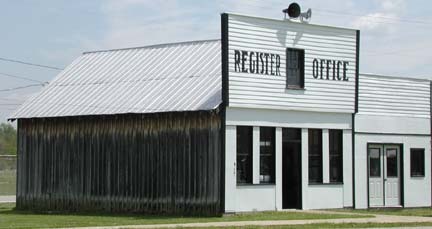 All material for the Register Office, which is 20' X 32', were purchased by The Point Pleasant Register. The Good Sam Travel Club, headed by Nelson Ring, who served as supervisor, contributed greatly to this project. Some of the type and fonts came from L.W. Getty's business. The Register donated a Linotype Machine that is on display in the building as well as some composing tables that held drawers of different size type. The Linotype Machine was one of three that were located on the third floor of the Register building, situated at the time on Fifth Street in Point Pleasant. In the newspaper office you can see various types of printing presses. 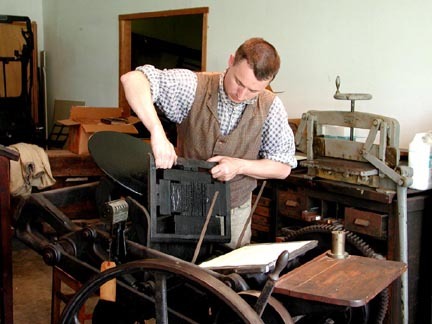 During festivals some of the presses will be in operation stamping out bulletins one at a time. Here a re-enactor operates one of the printing presses during Living History Days.